LOVE the texture the second band down adds to your stack!! Stack of the day. David Klass rose gold princess cut eternity using all the diamonds from my original set and two rose gold pave bands I found on EBay. waveonwave, SimoneDi, InsecureSweetGirl and 18 others like this. Wonky looking wonky with my two yellow gold bands..one new..one vintage..Wonky’s bezel is wonky but not THAT wonky! It’s a reflection.. Please excuse the chapped hand..The cold weather has done a number on them! LLJsmom, Stone Hunter, Lookinagain and 4 others like this. Ooh the middle is my favourite!!!! cal and kayla17 like this. Got an engraved band off EBay. The flower design goes all the way around so even if it spins it will still look pretty. Five little diamonds across the top. Excuse the polka dots, I was next to a window with a screen. InsecureSweetGirl, LLJsmom, Luce and 11 others like this. Stone Hunter, Sparkle_ruckle, junebug17 and 5 others like this. Mixing it up today with a totally sentimental stack. My original engagement ring on the top, the eternity my husband gave me for our 5th anniversary on the bottom, and his great grandmother's wedding ring in the middle. I could replace all my other pieces with money but these are absolutely irreplaceable! Also I totally love the big fat Edwardian ring with the two skinny ones either side Lucky for me the other daughters in law don't like yellow gold! SimoneDi, InsecureSweetGirl, blingthing and 6 others like this. Love it! I’ve been scouting eBay looking for an engraved band too. 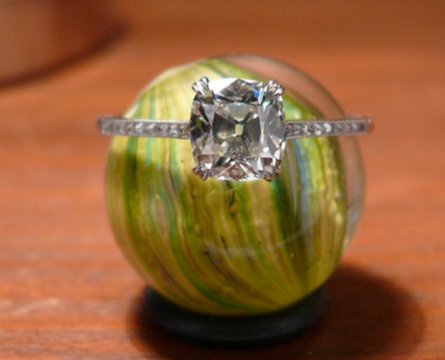 Your engagement ring is so pretty too! InsecureSweetGirl, LLJsmom, Stone Hunter and 5 others like this. Wow Kayla17 - your princess cut ring is gorgeous. I have a bunch on princess cut stones from my original engagement ring. I love what David Klass did for you with this ring. I may have to investigate this as I have not know what to do with the stones. May I ask - was his pricing reasonable for making the band? Love this stack. Hi, I have a thread but from what I can remember I had almost enough stones except for one. So he added the last diamond. The diamonds from the wedding band were also different sizes. One of the rings had smaller diamonds but he made the band in such a way that you can’t tell which are smaller. His price was under $500, but that included buying back my gold from my old set. He does offer to buy back your gold. When I had my new setting made he also offered to buy back my Stuller setting too. caf and elliefire99 like this. Thanks. It’s made from my original wedding set. THAnks Kayla17. It’s so pretty. Is it Comfortable? Yes it is but I requested that the inside be smoothed out bc I didn’t want a rough edge. How many princess cuts do you have? See..I LOVE your band...Do you know the width? The design looks very crisp! If I see one like yours it’s a done deal! Aw thanks so much @Mamabean, it is 2mm wide so it's actually the same width as the one on Etsy but depending on the setting on the ring you are pairing it with, you might need something a little wider so it shows up more. We are going to find you something, IT is out there trust me, I love the thrill of the hunt so I will keep looking for you. You might just need 1mm extra to make it work. LOVE this band with your ering @StephanieLynn!!! Mamabean and StephanieLynn like this. Stone Hunter and Mamabean like this. Stack for today..I would like the carved band to be a little wider...I’m on the lookout for a new to me band..
InsecureSweetGirl, Bonfire, LLJsmom and 4 others like this. Wore this sapphire set in white gold and a yellow gold band on my right hand today. I had to move them to my left hand to get a photo. InsecureSweetGirl, kgizo, foxinsox and 3 others like this. I love this combo. I quite often wear my 18ct yellow gold band with my platinum hot pink sapphire solitaire on my right hand. I say often, as it depends on nail colour. I’m quite picky about wearing a bright pink stone with burgundy nails. Urgh! I know this isn't a photo of them on my finger, but I wear these two together often and love them. Tiffany Legacy platinum band with 2.03ctw asscher band, set by DKJ - also platinum. InsecureSweetGirl, Bonfire, LLJsmom and 2 others like this.